Going through Bandcamp once more, this one just “looked” like a melodic death album. The dark yet bright artwork and logo just had that modern feel to it. Enough to warrant either the assumption was correct. 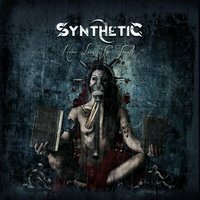 Here Lies the Truth is Synthetic’s debut, and the UK band was also able to enlist the efforts of Soilwork’s Dirk Verbeuren on “Hollow” as well as the mixing skill of Disarmonia Mundi’s Ettore Rigotti. Strong selling points for a young act, but don’t let that overstate the band’s actual work on their first full-length. Sonically, Synthetic occupies much of the soundscape that the afore-mentioned acts live in (Rigotti was a perfect pick for this mix). Modern melodic death metal with upbeat keyboards, driving and catchy riffs, and a combination of gruff and clean vocals. Listening to the opening numbers “Lies” and “Synthetic” should be enough to convince anyone of the band’s potency. They’ve nailed the catchy chorus/rough verse that so many of these bands linger around in, but it turns out that Synthetic is capable of pulling off a little bit more to ensure they don’t sound like Soilwork Version 200.” “Still Cold” jettisons the melodic death metal aspects almost entirely, moving into more rock-ballad territory. This could have be the stroke of doom for the band, but they make it work and avoid the usual helping of cheese that permeates a track like this. This is a bit of a turning point for the album, which then sees some more modern influences blend with the melodic death metal ones, with “Forgiveness” and “Scream in Your Dreams” following suit in a similar manner. Full of formidable melodic hooks, Here Lies the Truth is an addictive piece of modern melodic death metal. Not afraid to stay true to the band members vision and go “outside the lines” when needed, they do a good job of balancing the parts to keep the album cohesive. Let’s see where they take it from here.